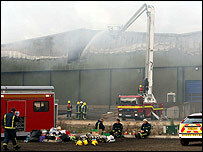 A firefighter has died and three others are missing after a suspected arson attack at a warehouse in Warwickshire. 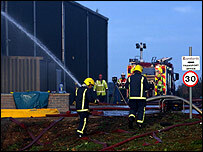 The crew member's body was recovered during the blaze at the vegetable packing plant in Atherstone on Stour, near Stratford-upon-Avon. The fire, on Atherstone Industrial Estate, started at 1845 GMT on Friday. Hopes were fading for the fate of the missing firefighters and union leaders said the incident may be the worst loss of life for more than 30 years. Andy Dark, assistant general secretary of the Fire Brigades Union (FBU), told BBC News the potential loss of four lives would make the incident the worst loss of life among its members since 1972. It is believed that warehouse staff were in the building when fire broke out and Mr Dark said crews would have been sent in if they thought more civilians may be inside. He said: "If there is any doubt in the mind of the firefighting crews, and particularly the officers in charge of those crews, that there may be a risk to life in that building they will commit crews where they believe it is safe to do so. "That is primarily what we are - our core and primary function is to save life and to rescue." Up to 100 firefighters and five ambulance crews were called to the scene and up to 16 fire engines were used to tackle the blaze, which was still alight on Saturday morning. A search of the building for the missing firefighters is to get under way as soon as colleagues can enter the building, which suffered a partial collapse during the fire. Police said they were treating the blaze as suspicious and the county's chief fire officer said it was a building "where we would not expect a fire to start". He said: "We were all hoping against hope that the situation we found ourselves in wouldn't turn out to be true. 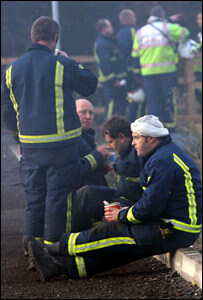 He added that hopes of finding the three missing firefighters safe and well had "pretty much faded now". Mr McGregor said the firefighter who died had been taken to Warwick Hospital following attempts to resuscitate him as soon as he was brought out of the building. William Brown, Warwickshire Fire and Rescue's chief fire officer, said: "We are deeply shocked by tonight's tragedy. "Our hearts, thoughts and prayers go out to the families and friends of our firefighters. "The firefighters tonight were heroically doing their job. "Our thanks go to our colleagues in the emergency services, the police, ambulance and of course our cross-border firefighters, who have worked with us and supported us through this terrible night. "Tonight has been one of those events that firefighters all over the world dread and it's happened to us here in Warwickshire." Asked why the fire was being treated as suspicious, he said: "This fire has started in a building where we would not expect a fire to start. "We don't know what has caused the fire. "And we just approach it from that position - treat it as suspicious to start with and find out why this fire started." Ch Supt Mak Chishty of Warwickshire Police said a full investigation into the cause of the fire had already begun and investigators from the police and fire service would be examining the scene after daylight on Saturday. He said: "Our thoughts are with our colleagues in the fire service today and with the family and friends of the firefighter who has died and those who are missing." He said he became aware of the fire when he lost his water supply, with water being diverted to use to fight the flames. He said: "From the road you can quite clearly see the blaze above the tree line and above the roof line of the building. "There's a lot of smoke, and obviously a lot of police presence."